The following Sunday, 10th February, we staged the Open Singles, Open Doubles, Junior and Ladies events. The day was a triumph for the popular Adam Laws. He won the open singles, open doubles and mixed doubles championships. This was his eighth open singles victory equalling the record of the late, great Terry Haley but still one more to go to match the late record holder Jack Harrington.. The open singles were played in groups and the eight seeds proceeded fairly serenely to the quarter finals. There were a few exceptions. Adam Laws had a scare in his groups against Julie Lawrence 12-10, 9-11, 12-10, 11-3. Young Charlie Cunningham took Rory Scott to five as did Sarah Horsnell and Richard Seymour had a close match against Brian Mitchell. The quarter finals saw some epic matches. Simon Vine losing two deuces to Adam Laws, Richard Seymour losing three straight to Federico Viterbo, Phil Snelson beating Rory Scott in four and Rob Pountney just overcoming John Robinson in five with the third leg going to 20-18! Both semi-finals went to four with Federico Viterbo and Adam Laws securing victories against Rob Pountney and Phil Snelson. This set up an intriguing final between reigning champion and number one seed Viterbo and number two seed Laws (left). The first game was a cut and thrust affair with both players making unaccustomed errors. Laws crept in 12-10. There was suddenly a steely determination about Laws’s demeanour and having taken the first leg he was determined not to let the match slip. He has very strong serves with a powerful follow up and he used these strengths to great advantage to take the next two sets 11-7 and 11-4. It was in 1996 that the writer lost in the final in three sets to an up and coming youngster called Adam Laws – 23 years later he recorded his eighth success. As in the singles the doubles saw the four top seeds getting through and competing in the semi-finals. Pountney & Laws beat Robinson & Seymour 5-11, 11-7, 11-8, 11-7. The other semi-final was a humdinger. Number one seed Federico Viterbo and Simon Vine played Phil Snelson and Julie Lawrence. The left hand/right hand combination is always helpful but coupled with Snelson’s booming forehand and confusing back hand block with pimples and Lawrence’s devastating back hand hit straight off the bounce they make a very effective pairing. This match was of high quality and Lawrence and Snelson won 11-4, 12-14, 11-9, 8-11, 11-5. Maybe this was a step too far, or did the semi-final drain their energy? because their final against Laws & Pountney (left) ended up a one-sided affair as they lost 7-11, 11-8, 11-2, 11-4.
has won the Guildford closed on six occasions. It is testament to Bhalla’s enthusiasm and dedication that he won 6-11, 14-12, 11-3, 11-5. In the other semi Chris Pullinger (right) beat Rob Chatwin 11-3, 11-1, 13-11. 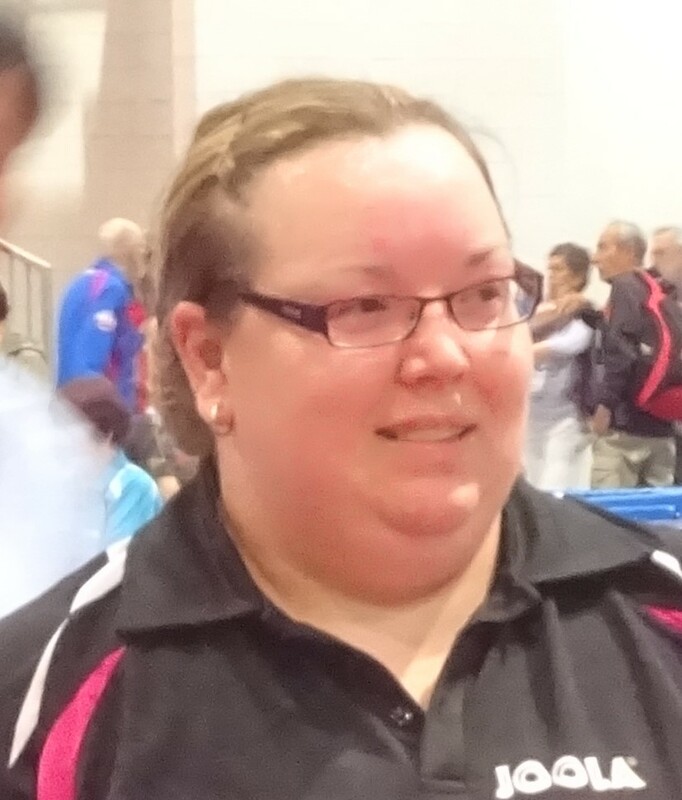 In the final, Pullinger who had been playing well all day, beat Bhalla 11-2, 11-4, 11-9. The Ladies Singles was played on a group basis with Sarah Horsnell (left), Fei Fei Pei, Maria Hilsdon and Ruochen Liang reaching the semi-finals. Liang lost to the more experienced Pei 9-11, 8-11, 11-13. Nine times winner and reigning champion Hilsdon lost to number one seed, the powerful hitter, Horsnell 15-17, 4-11, 6-11. In the final Sarah was just too powerful for Fei Fei and won 11-6, 11-3, 11-9. The Ladies Doubles was played on a round-robin basis and Fei Fei Pei and Sarah Horsnell beat Julie Lawrence and young Katie Snelson 11-6, 11-3, 11-8 in the decider. In the Ladies Veterans competition Sarah Horsnell powered her way through to pick up her third title. A good days work Sarah! The Mixed Doubles was of the highest standard in living memory. The semi-finals saw four high quality pairs pitched against each other. John Robinson and Maria Hilsdon succumbed to the highly fancied Julie Lawrence and Phil Snelson 11-6, 11-6, 11-6. At least it was consistent! Ruochen Liang and Adam Laws playing together for the first time beat number one seeds Fei Fi Pei and Federico Viterbo 8-11, 11-8, 11-7, 11-9. In a fantastic final Laws & Liang (left) just beat Lawrence & Snelson 7-11, 11-5, 8-11, 11-8, 11-7. Phew! An innovation was to include the junior events on the same day as the senior competition. This also allowed the young players to participate in the open singles which was a great experience for them. In their own category, competitions were held at under 13, under 15 and under 18 levels. The under 13s played in a giant group of six players. They all played each other – a total of fifteen matches. Two players emerged to play a final in which Jamie Orton beat Dan Godsill 16-14, 11-6, 11-4. Orton was unbeaten. In the doubles Dan Godsill and Jack Hongjuan had a good win over Ashley Minoo & Jamie Orton 11-7, 11-9, 6-11, 11-5. The under 15s singles was played in two large groups with Max Flint, Vincent Quiambao, Katie Snelson and Jamie Orton reaching the semi-finals. Flint beat Snelson 11-5, 11-5, 11-2 and Quiambao beat Orton 11-5, 12-10,11-9 in what turned out to be a nail-biter. Flint beat Quiambao 11-4, 11-4, 9-11, 11-6 in the final. This match was filmed by Vincent’s father. The final of the under 15 doubles saw Max Flint & Tom Gartner beat Vincent Quiambao & Jamie Orton 11-4, 11-8, 6-11, 11-6. But what about this result in the semi-final? Flint & Gartner played Katie Snelson and Vlad Cretu. Flint and Gartner won 11-0, 11-5, then took their feet off the pedal and lost 9-11, 11-13 to finally scrape through 11-7. There’s a lesson to all young players! The under 18s was played in two groups. Charlie Cunningham and Gabriela Lee overcame their opponents and played each other in the final. Gabriela had previously only dropped one set to Max Flint but found Cunningham just too strong and lost 11-6, 11-9, 11-7. In the doubles semi-finals Gabriela and Katie had a good win over under 15 champions Flint & Gartner 11-1, 11-13, 11-6, 5-11, 11-8 and James Scott and Charlie Cunningham beat Ryan Bowdler and Henry Evans 11-8, 11-5, 11-7. The final was tough and the strong pair of Cunningham and Scott beat Lee and Snelson 11-4, 11-4, 14-16, 11-8. There were 153 matches played on the day and add that to the 136 played on the previous Sunday it makes a total of 289 matches. This doesn’t happen without a lot of help. Thanks to Adam Laws and Trevor Free for running the junior events, John Robinson for aiding on the results table and looking after the finances, David Lush and Steve Day for scoring above and beyond the call of duty. Tony and Shula Laws for organising the venue and all the players for putting up and taking down the equipment and umpiring without a single quibble.